This post contains affiliate links: if you buy something I’ll earn a small commission at no cost to you. Thanks for supporting Life As A Strawberry! I frequently ask people what their biggest cooking struggle is. The number one answer I hear? Cooking seems to take a lot of multitasking – how can I make sure everything is hot and ready to eat at the same time? 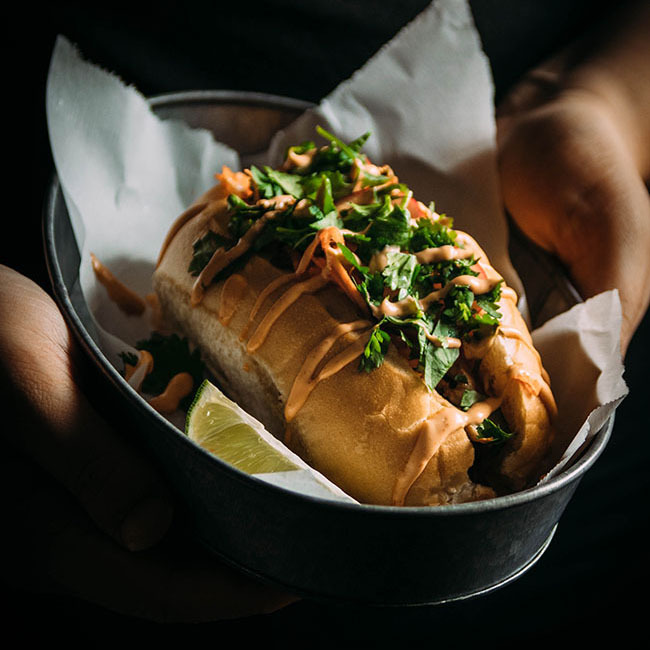 We’ve all been there – you’ll start a few things for dinner but get a case of “shiny object syndrome” and get distracted, or your main course will be done too early and get cold while you hurry to finish your side dishes. 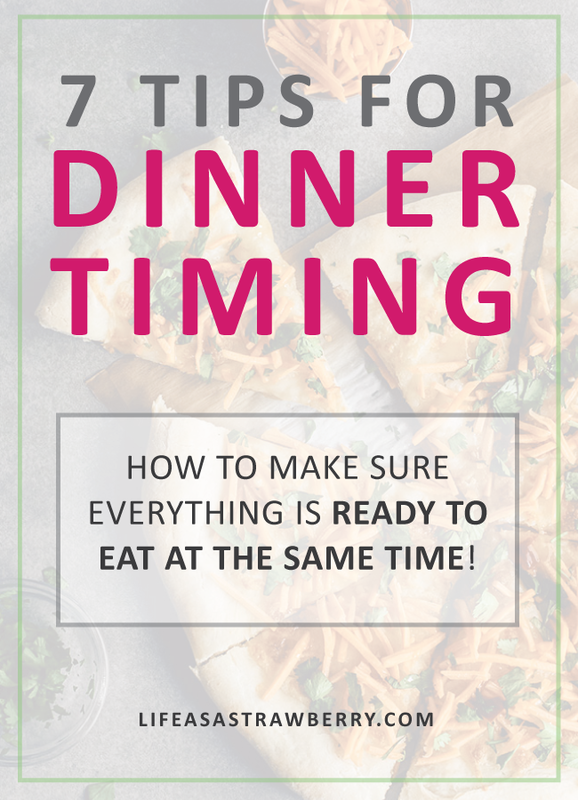 There are a ton of variables in every kitchen, and timing your dinner can feel frustrating and overwhelming (especially if you have hungry people waiting!) Fortunately, there are a few handy tricks to help you beat the dinner overwhelm and get everything on the table. Here are my BEST tips to help you time your meals perfectly every time! 1. GET A GREAT TIMER. There’s no reason to mentally keep track of the cooking time for every pot on the stove! Instead, use an app like Thyme to manage multiple dishes. Thyme lets you set a separate timer for each burner on your stove (and your oven, too!) so you don’t have to worry about keeping track of four things at once. This app gets a ton of use on my phone – particularly at holidays, when I have a million things going at once and don’t want to worry about remembering when to take things out of the oven or off of the stove! Nine times out of ten, major cooking delays come from a combination of “OH SNAP I NEED AN ONION FOR THIS” and some frantic chopping of said onion while something else burns on the stove. Mise en place literally means “to set in place,” and it’s one of the best things you can do to streamline your cooking process. Before you start to cook, go through the recipe’s list of ingredients and prepare everything you need: chop produce, peel garlic, measure out spices and seasonings, etc. I like to prepare each ingredient and then pop it in a small prep bowl and set it aside until it’s time to add it to the recipe – then, it’s as simple as grabbing the right bowl and throwing it all together! 3. MEAL PREP IN ADVANCE. Meal Prep and Mise en Place go hand in hand for me – they’re both essential to streamlining your cooking process and save you time in the kitchen! Doing more in advance means there are fewer tasks to distract you while you’re actually making dinner – and that means you can get dinner on the table more quickly without draining all of your energy after a long day. I like to meal prep when I get home from the grocery store or farmer’s market. I chop any veggies we need for the week, cook up some slow cooker chicken if I need it, and portion out any snacks or salads into individual containers. I like storing my prepped ingredients in airtight glass containers that can go from the fridge to the oven to the table to the freezer if need be – it cuts down on cleanup and makes for easy storage. 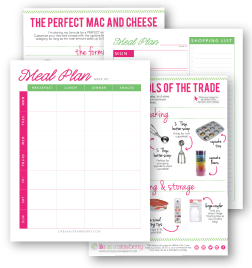 PS – For my favorite meal prep strategies and checklists, make sure you join us in the 5 Day Meal Planning Challenge! 4. EMBRACE ONE POT MEALS. Growing up, I remember having a bunch of components to family dinner. We’d have a meatloaf or something, but then there would also be mashed potatoes! And peas! And a salad! And honestly? Now that I’m an adult – even though I’m an adult that works in FOOD – that’s just WAY too much work. My favorite way to make sure every part of dinner is done at the same time is cook it all together! Opt for one pot meals like these easy Zucchini Udon Curry Bowls or this Healthy Shrimp Alfredo for a quick and simple dinner. One pan meals like this Easy Sausage Bake are also a great way to build in some veggies on the side without dirtying extra pots or needing to keep track of multiple recipes. On especially busy days, you can even take it a step further by choosing slow cooker recipes like these Pesto Chicken Sandwiches that cook all day and are ready whenever you are. I knoooooooow, I know: Leftovers are a bit contentious. 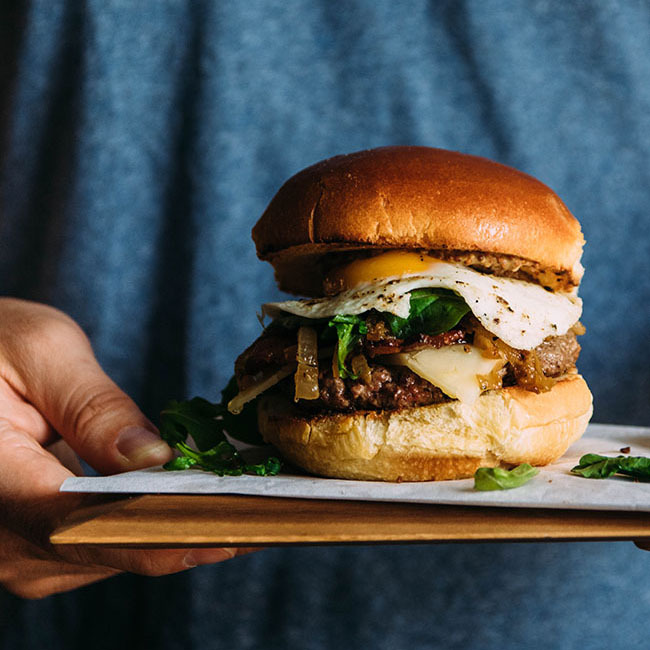 Who wants to eat the exact same thing over and over? (Nobody. That’s who). HOWEVER. Leftovers are also a great way to speed up your weeknight meals and streamline your dinner so that everything’s ready at the right time. But that doesn’t mean you have to eat the same thing again and again! Instead of just heating up leftovers for dinner, try repurposing some of your leftovers into brand new dishes. Have chicken and mashed potatoes last night? Form those potatoes into small discs and fry them up like pancakes for a new side dish. Have leftover sauce from spaghetti and meatballs? Turn it into a meatball sub with plenty of fresh mozzarella. How about leftover grilled asparagus? Toss it in the food processor with some basil and olive oil for a quick, smoky pesto to add to pasta, salads, or pizza. There are plenty of ways to repurpose leftovers – a quick Google search will usually yield some fun ideas if you’re not sure where to start! If you’re making a few different things – like side dishes, sauces, and appetizers – make a quick list of everything you’re cooking and jot down how much time each dish should take to prepare. Decide what time you want to serve dinner, and then work backwards from there to determine what time you’ll need to start each dish. Recipes that take the longest should be started first, and less time-intensive recipes can be started closer to dinnertime so that everything is ready all at once. (When I worked in catering, this was our GO-TO STRATEGY for menu planning, because it ensured we’d have everything ready for the client right when we needed it). If a recipe has a few different components – like searing, sautéing, and braising – you may want to break down the recipe even further and write out the estimated time each STEP of the recipe will take so that you can plan accordingly. If you still need to prep some dinner ingredients, be sure to account for that time as you work backwards. If you’re making a dish that needs 30 minutes to cook, but you haven’t washed or chopped any of the veggies for it yet, give yourself an extra 15 minutes or so to get that prep done so that you’ll still be eating on time. I also like to give myself a buffer of a few minutes just in case I run into any extra tasks as I cook. Cooking, like anything, takes practice. The more you do it, the better (and faster) you’ll get – so keep going, even if your timing isn’t perfect on the very first try! (I’ve spent my professional life in all aspects of the food industry, and I still definitely forgot I had cupcakes in the oven last Thanksgiving until it was wayyyyy too late). For a hands-on, step-by-step training series on meal planning and prepping like a pro, be sure to click here and join us in the FREE 5 Day Meal Planning Challenge! Don’t forget to sign up for my FREE 5 Day Meal Planning Challenge! Click here to join us and jump start your healthy, easy meal planning routine. Challenge starts August 6th!